Two pictures below of area behind the coffer dam at peg 1……..
Marius Macenas fished the Kemeys beat on the Usk yesterday Thursday 11 April and caught a 10lb Salmon on the fly. See the pictures below, the salmon was returned to the river and swam strongly away. Due to the work still not being completed at Cyfarthfa park I have decided to move the first carp league competition this Sunday (the 7th April) up onto Top Pond Pen-Y-Wern. I would like to ask anyone wishing to fish the league this year to meet at the carp park at the centre of Top Pond at 08:30 this coming Sunday. Please do not forget that this is a CARP LEAGUE so anyone turning up with any fishing gear that isn’t a carp fishing set up will not be allowed to enter the competition. Also each competitor must have a suitable net (36” minimum) an unhooking mat or cradle, carp care kit, a suitable weight sling. These are minimum requirements for entry. Result of the first senior coarse match held at Riverside Fishery Ystrad Mynach. 1st Dia Couzens 23lbs 12oz. 2nd Mark Sweeney 10lb 12oz. The Senior Competitions start on Sunday at Riverside Fishery Ystrad Mynach, the draw takes place at 8.30am and we start fishing at 10am and finish at 3pm. If you fancy a go and are a member, Doug would love to see you there. For the rest of the dates of the competitions and the times please follow this link. and 8 January 2020 . We are sorting out the islands in Cyfarthfa Park Lake at 9.30 this Saturday, if you can come we are meeting at the Cefn End. Many people have started renewing their fishing licences. We are aware that some websites are offering to buy or check licence applications on your behalf. The Environment Agency does not endorse these services. As you renew your licence online, always get your licence direct from GOV.UK and take extra care when using a search engine that you don’t stray onto other sales sites. Getting your licence direct from us is cheaper, quicker and a lot simpler. 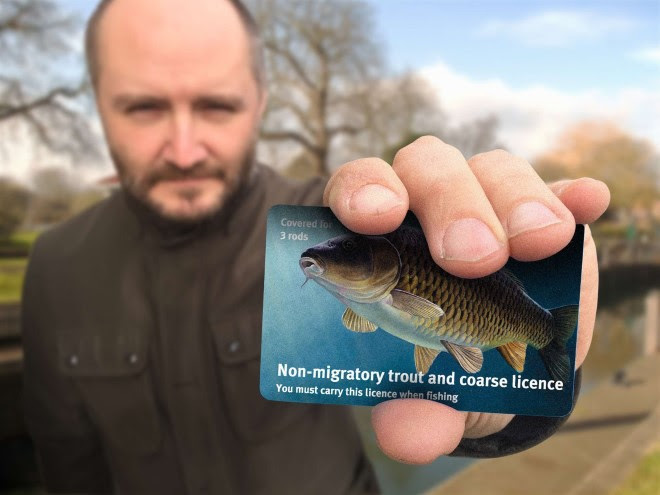 You can also get your fishing licence by calling our telephone sales line on 0344 800 5386 or from your local post office. New Carp were stocked today 20/1/19 in Cyfarthfa Park for the pictures follow the link below, the last picture is one of Tom Phillip’s father and mother who have named the carp they are photographed with as Tom in memory of their son who was an avid carp angler. The event below takes place on 19 Feb and will follow the canal towpath from Brecon to Talybont, if you fish the canal be aware that more people than usual will be passing you.